Rhizome | Blog Posts tagged "whitney museum"
Giampaolo Bianconi | Wed Oct 10th, 2012 10 a.m.
Untitled, 2010. Epson UltraChrome inkjet on linen; eight panels, 305 x 69 in. (774.7 x 175.3 cm) each ; 305 x 586 in. (774.7 x 1488.4 cm) overall. Collection of the artist. Photograph by Lothar Schnepf. The language of Wade Guyton’s mid-career retrospective at the Whitney emphasizes that, like any other user, Guyton approaches technology unenlightened as to its inner workings. Choosing to make his printer drawings, in which images from books and magazines are printed on, Guyton rendered simple marks in Microsoft Word. Unlike other users, perhaps, Guyton is aesthetically excited by technologies limitations and preconditions, viewing them as an element of chance in his work. The exhibition, made up mostly of inkjet on linen paintings, aptly shows Guyton’s modernist collaborations with new technologies, reinscribing the greatest hits modernism within a different context. Transparency, monochrome, and the readymade all make their expected appearances. 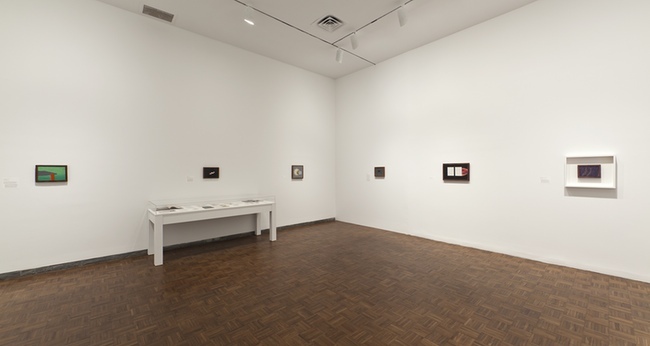 A four panel transparent window, with printer drawings of works by Frank Stella, Duchamp himself, and others, emphasize his investment in 20th century modernism while referencing obliquely computer technology as a low-tech window and bulletin board. The printer drawings play with material images from books and magazines. This emphasis on origin and location contrasts with his engagement of technologies that have done so much to dematerialize our engagement with images. One inkjet painting does come from a “source file”: it contains an image of Kenneth Noland’s True North (1961), scanned, printed, and disturbed by five runny black disks. More explicitly minimal works—an inverted woodpile or inkjet on wood sculpture—round out the show. Karen Archey | Thu May 24th, 2012 3:26 p.m. Looking back at the time in which I was beginning to study art, one could describe the motivations I shared with my peers as generally aspirational and humanitarian. We felt different. 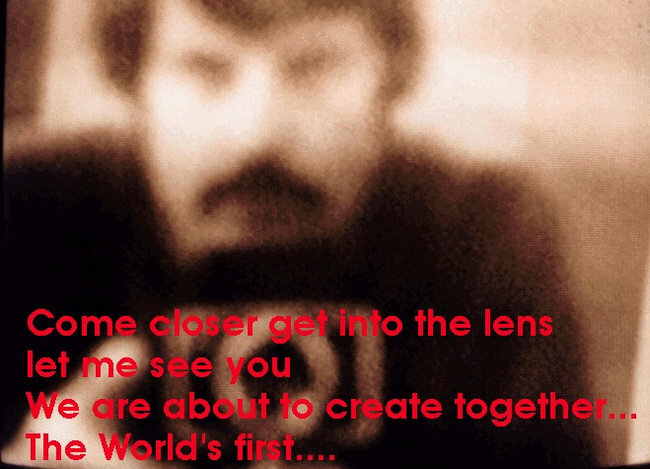 We wanted to change the world. We thought of the institution of art as a discipline in which alternative personalities flourish, critical thinking is lauded, and that creativity (in all of its various forms) is esteemed far more than financial privilege. Having participated in the art industry for a number of years, these ideas now seem not only naïve, but provide a blueprint for precisely how the art world does not operate; our collective wills becoming inured to the faux-radical, contradictory reality that the institution of art exists in today. 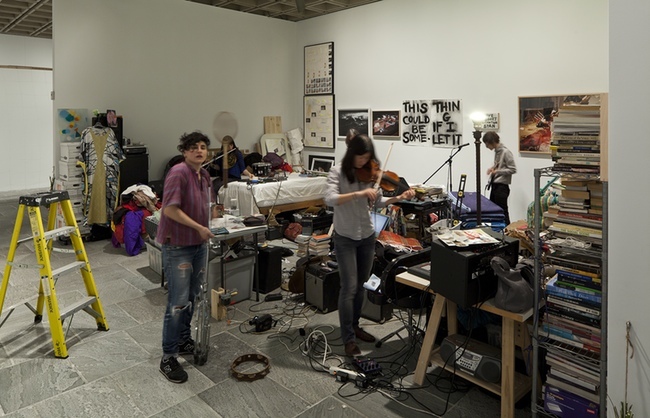 On the occasion of the 2012 Whitney Biennial, Andrea Fraser writes of the crisis of the art institution, “The glaring, persistent, and seemingly ever-growing disjunction between those legitimizing discourses [of art]—above all in their critical and political claims—and the social conditions of art generally…has appeared to me as profoundly and painfully contradictory, even as fraudulent.” Her essay for the Biennial catalogue “There’s no place like home,” painstakingly delineates what she perceives to be the impossibility of participating in the institution of art in good conscience due to its compliant enrichment from the increasing financial inequality of the last decade. Acknowledging the fact that this inequity is precisely what art purports to act against, Fraser considers possible methods through which this quandary may be alleviated. She posits, almost fatalistically, that “Certainly it is less painful to resolve these conflicts symbolically, in artistic, intellectual, and even political gestures and position-takings, than to resolve them materially—to the marginal extent that it is within our power to do so in our own lives—with choices that would entail sacrifices and renunciations. Even these sacrifices may be preferable, for some, to the pain of wanting what we also hate, and hating what we also are and also love...” Heady prose for a biennial catalogue. Louis Doulas | Tue Feb 7th, 2012 10 a.m.
Ursula Endlicher, Light and Dark Networks, 2011. The Whitney’s Sunrise/Sunset project consists of a series of commissioned internet based works that exist within the axis constraints of Earth’s orbit: New York City’s sunrise and sunset. Besides the entire website’s background transitioning from white to black each day representing this shift in time (white for day, black for night), each project is designated a net presence between ten to thirty seconds—that is, within this brief timeframe, each work gets to take over the entire Whitney site once only at sunrise and once at sunset; the exact times for each determined day to day by the weather among other environmental fluctuations. Sunrise/Sunset is part of Whitney’s Artport—an online gallery space demonstrating the institution’s own internet awareness. 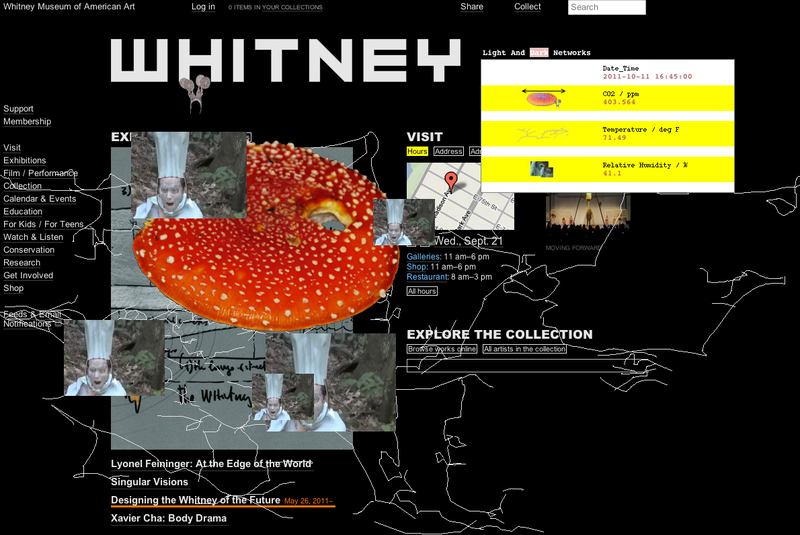 First launched in 2002, Artport attempts to engage and archive internet and new media based practices through the commissioning of works specific to whitney.org as well as documenting all Whitney based net/new media exhibitions. Currently, Artport is featuring commissions from Ursula Endlicher and Scott Snibe. Light and Dark Networks is a ten second piece from Endlicher that continues the artist’s interest in ‘data performances’. The morning encounter involves a spider web that is blown into multiple directions of the website based on current New York weather and CO2 levels. At sunset, an image of the mycelium of a mushroom grows or shrinks based on the temperature of the city while also responding to humidity levels which generates videos of the artist, costumed and reenacting the mushroom’s physical reactive changes. Endlicher draws attention to the way information and data inform and affect the physical, as well as how the physical can inform quantification itself. Snibe’s, Tripolar was originally commissioned in 2002 by the Whitney but now has made its renewed debut as an iPhone and iPad application. The app involves the path of forms made from a user’s point of touch, reacting to the effect a pendulum makes while swinging over three magnets, resulting in a scribbled line drawing. Through the app a user can also add, remove and place magnets as to customize and experiment with formal variations of line. The work, first exhibited in online exhibition CODeDOC, demonstrates the way the input [code]—through random or subtle manipulation—drastically changes its visual output, creating chaotic and unpredictable outcomes.